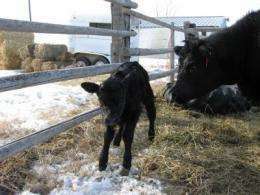 How cold is too cold for newborn calves? It has been estimated that in the United States, nearly 100,000 calves die of cold stress annually, costing livestock producers millions of dollars a year and resulting in a desperate need for effective mitigation strategies. Consequently, a University of Miami (UM) scientist and researchers from the National Oceanic and Atmospheric Administration (NOAA) have developed the first weather system advisory designed to improve the capacity of producers to protect their newborn calves. "The impact of weather on livestock is a very important economic consideration to the region," said Larry Kalkstein, UM professor from the department of Geography and Regional Studies, at the College of Arts and Sciences. "Our project is an essential first step, toward helping livestock producers across the country reduce winter weather related losses." Kalkstein and NOAA scientists reviewed 10 years of climatological information from Glasgow, Montana. The researchers teamed up with local ranchers to determine critical weather elements and lead time needed to take action to protect newborn livestock. The data collected helped create the Cold Advisory for Newborn Livestock System (CANL). Beginning this month, CANL will provide guidance on the Glasgow, Montana National Weather Forecast Office Web site and NOAA All Hazards Weather Radio. Graphical products will be issued daily showing specific thresholds that impact newborn livestock, based on a variety of forecast factors including temperature, humidity, and precipitation. "This system allows us to provide ranchers in Northeast Montana with enough lead time to bring livestock to shelter and mitigate loss due to weather," said Tanja Fransen, warning coordination meteorologist at the Weather Forecast Office in Glasgow.